Master Egyptian drummer & dancer Karim Nagi will teach you the secrets for performing an exciting, spontaneous live Arabic drum solo. A live drum solo is a stellar moment between a dancer and a drummer. Together, they create a joyful instance of dynamic synergy & synchronization, which thrills and enchants the audience. But it is challenging to create a spontaneous duet, especially without rehearsal or preparation. 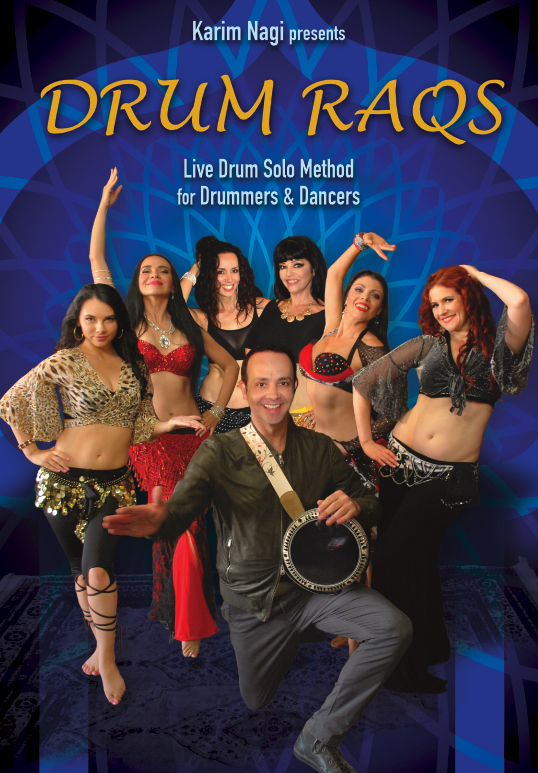 Master Egyptian drummer & dancer Karim Nagi will teach you the secrets for performing an exciting, spontaneous live Arabic drum solo. He’ll explain, demonstrate, and de-mystify all the major recurring drum solo themes. Six world-renown dancers accompany him, illuminating the various ways seasoned professionals responds to each theme. Dancers and drummers will learn the intrinsic collaboration of a duet, how to cue each other and improvise together. After working with this DVD, you’ll both be confidently connecting sound to body, in a live drum solo performance that will enrapture audiences.